A quick inspection before going on holiday. A good proportion of the comb, in the super, that I put on last week, has been drawn down. Checked the first few frames in the brood box, just making sure that the bees had enough room for the next week or so, as we’ re heading away for a holiday. Moved a frame of stores to the very back of the brood box such that there were two pretty much unused frames between it and the brood nest. Didn’t see the queen, but did see substantial amounts of sealed brood and a number of larvae. Having been away in Austria for 6 days, took a quick peek on my return. The super I put on a fortnight-or-so-ago was nearly full (heavy!). Bees have been busy! Checked the first 7 frames in the brood box – stopped when I came across the queen. The last frame is all stores, after that 2 frames of not a whole lot, some pollen and nectar. Frames 8 through 5 were all brood, mostly sealed with some eggs and larvae too. Saw a few drones, but not many. Several queen cups, but none with eggs in. Saw the queen on frame 5, and called it a day. Intend to split within the next four days or so, on a day when the weather is good. Knocked together a home-made Snelgrove board today. 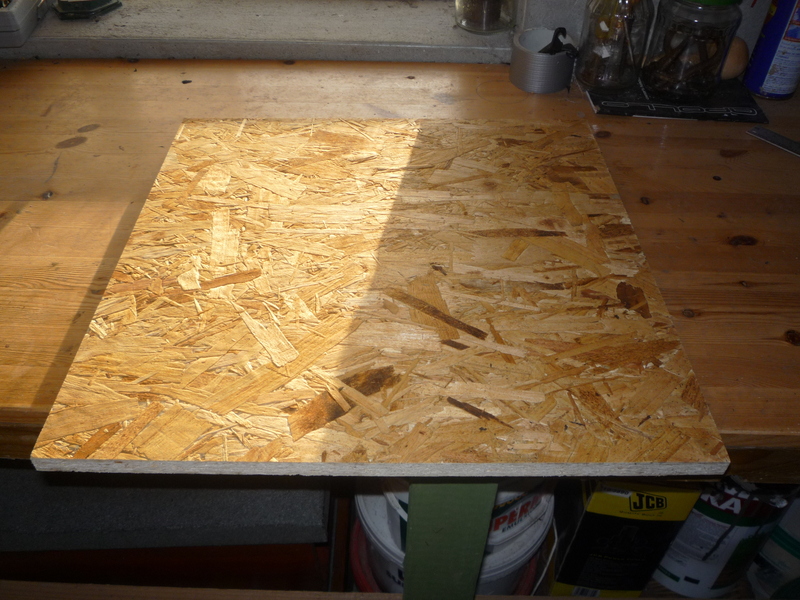 Bought a sheet of OSB from B&Q, and got them to cut it to size for me (46cm x 46cm, to fit my national brood-bodies). 46cm x 46cm OSB, cut to size by B&Q! Used a strip of 9mm wide skirting board for the edging! The varoa mesh (used either side of the central hole) I bought from The Mesh Company in England – delivery courtesy of Parcel Motel. Having completed the build of my home-made Snelgrove board on Saturday, and with my single colony now across 8 frames within my National brood box, I decided to split the hive today. I took three frames of brood, complete with nurse bees, from the existing brood box, and placed same, plus a frame of stores, into a new brood box. 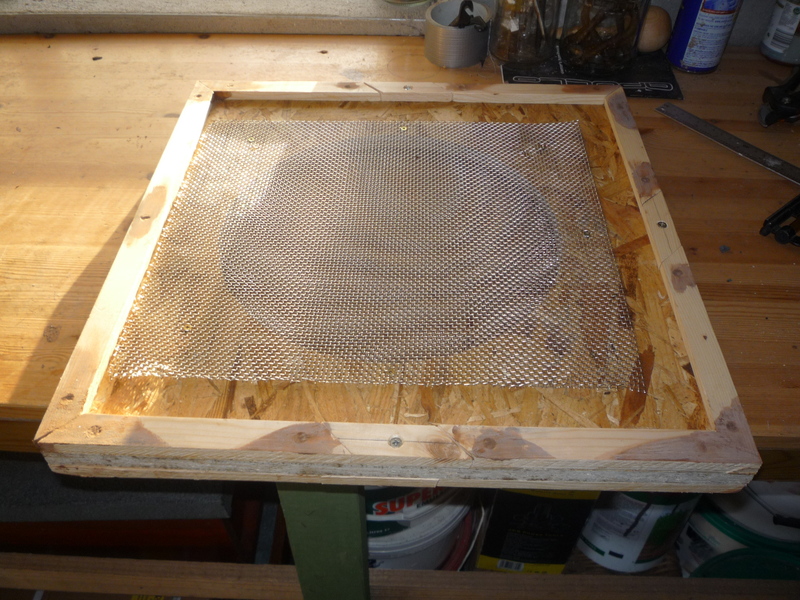 I also added three frames of drawn comb [which I had in store], and finally four frames of foundation. 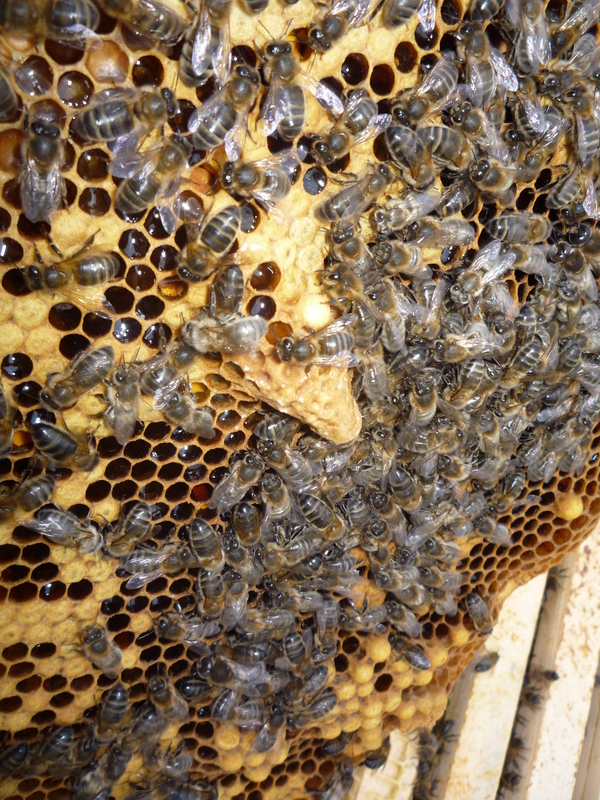 I left the queen in the old brood box, and backfilled that with four frames of foundation too. Old brood box (containing existing queen). Super x 1 (almost full of stores, having already been on since early April). I’ll now check the top brood box in 4 or 5 days to see if the girls have drawn a queen cell or two…fingers crossed. If they don’t, I’ll just reunite the hive and wait until queen cells are start being drawn, before trying again! The weather has been miserable so far this weekend (overcast and drizzly) but it dried up a bit after lunch today, so I decided to take a peek in the top half of the vertical split which I put in place 7 days ago. Anyhow, now I know I have a queen on the way, I’ll leave the top colony alone for 10 days or so. I’ll take a look at the bottom colony during the week, just to check that the existing queen down there is still laying ok, and that they’re ok for space. Checked the bottom half of the split. Saw the queen, plus plenty of eggs and brood on the first 6 frames, but the 4 new frames of foundation that I put in after the split still haven’t been drawn down at all. Will leave them now for 10 days, just to get on with it, as they have enough space and the queen is doing her stuff. Checked the top half of the split this evening. Looking promising! There’s a hole in the bottom of the queen cell (see pic from 4th May, above) so she hatched ok. The frames are also much more organised with the random nectar/stores all gone and now positioned around the edges of the central frames. As such, although I didn’t spot the queen herself, I reckon she’s in there. The weather has been fine too, so she should be mated soon (if not already)…will check next week to look for eggs, larvae and maybe even sealed brood.